Like road traffic, the media world presents its share of dangers that children need to be made aware of and protected from. 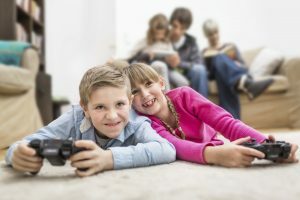 Parents are generally familiar with traditional media such as books or movies, and they are able to make informed decisions on what is appropriate for their children. Computers, video games and the internet, on the other hand, are uncharted territory for many people. Understanding and being able to deal with modern media is generally referred to as media literacy, and it is a skill that is equally important for adults and children to possess. The German government and other institutions in the country have launched large-scale campaigns to promote media literacy. These include the initiative ‘Schau hin’ (‘Look closely’) from the German Federal Ministry for Family Affairs, Senior Citizens, Women and Youth in partnership with the telecommunications company Vodafone, the public-service television broadcasters ARD and ZDF, and the TV guide ‘TV Spielfilm’ . Organisations such as the Spielraum institute at TH Köln – University of Applied Sciences and the German Federal Agency for Civic Education also provide support for practical media literacy education. For example, they host LAN events for parents so that they can experience their children’s behaviour while playing and learn more about computer and video games through discussions with experts.